Unlike many websites which rely on automated news selection, APA policy is that all news links are reviewed by a news editor before posting to ensure relevance and quality. News link tables from preceding years are archived annually as a resource for researchers. Bill Sweetman AW&ST 13/09/2013 Commentary: Do Russian Radar Developments Challenge Stealth? Генконструктор НПО "Сатурн" Юрий Шмотин: "Двигатель второго этапа подарит самолету пятого поколения новую жизнь"
Spent force: Are wars still winnable? 26/02/2013 Are Boeing's Battery Difficulties Part of a Much Bigger Problem? Can shale oil fuel Australia? AINOnline 04/01/2013 China To Acquire Tu-22 Supersonic Bombers? ADA Defender - Are the F-111s Really Stuffed? Media Release 14/02/2007 Is the Gordon England Letter on F-22 Export to Australia Fair Dinkum? Media Release 03/04/2007 Facts or Fantasies? 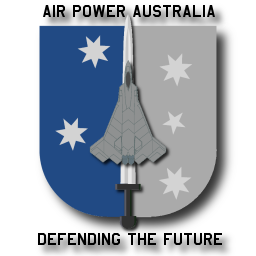 The centrepiece of the Canberra Defence bureaucracy's arguments against acquisition of the F-22 was a claim that the aircraft is not an effective bomber, despite the F-22 being the planned replacement for the F-117A Nighthawk bomber since 1999, and the primary element of the planned US Global Strike Task Force. The F-22 now carries the GBU-32 JDAM and is being fitted to carry the latest GBU-39/B Small Diameter Bomb (above). 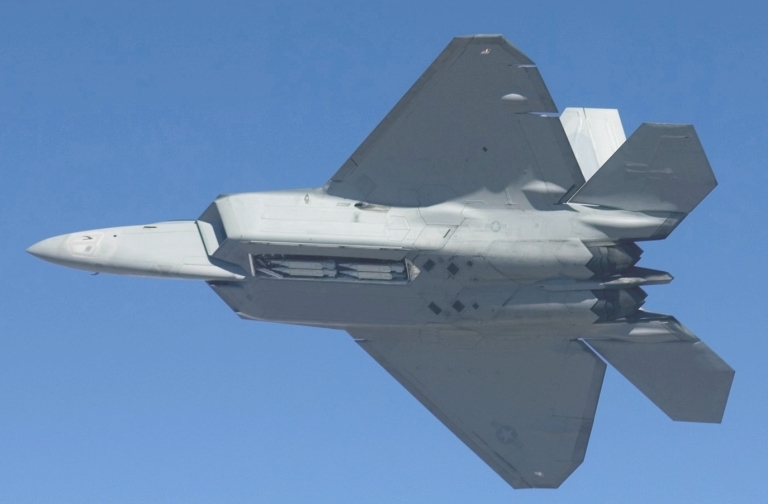 Like most other claims made by the Canberra bureaucracy to justify the Joint Strike Fighter, Super Hornet and early F-111 retirement, the claim that the F-22 is not viable as a bomber was and is simply fiction (US Air Force image). Don Middleton - ADA Defender - Summer 2006/2007 - Are the F-111s Really Stuffed? Lieutenant Colonel Neil James - REFORM OF THE DEFENCE MANAGEMENT PARADIGM: A FRESH VIEW - WORKING PAPER NO. 59, Australian Defence Studies Centre, May 2000. The F-111 was Australia's 'equivalent' to the US B-52 bomber, providing heavy punch for a variety of strike roles. Despite the size disparity, the F-111 typically carries around half the 500 lb bomb payload of the B-52H, albeit to a lesser distance. The US Air Force is likely to still be flying 1961 built B-52H aircraft in 2037, but Canberra bureaucrats retired the F-111 in 2010, despite its youth relative to the B-52H. In 2003 the Defence bureaucracy argued that the cost of running the F-111 would blow out in coming years. When this was proven to be wrong the Defence bureaucracy argued it was non-viable due to the absence of networking and modern digital weapons. 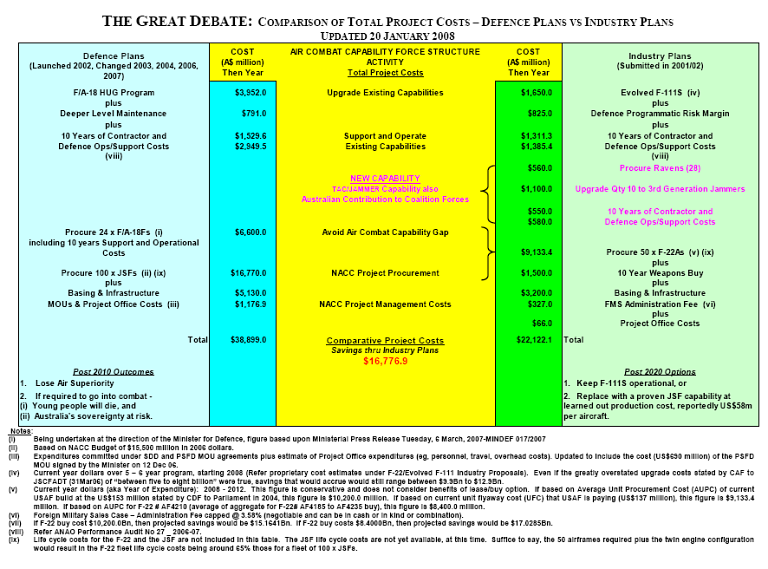 When this argument was proven wrong by RAAF/Boeing engineers who integrated JDAM and JTIDS networking using an internal shoestring budget, the Defence bureaucracy then argued unknown structural risks, despite the success of the second wing fatigue life extension testing by DSTO, the Cold Proof Load Testing capability in Australia, extensive wing refurbishment, the ongoing "safety by inspection program", the available wing refurbishment capability at Amberley and the very low cost of new build replacement wings as a fallback option. All of these capabilities existed; were assuring the airworthiness of the F-111 fleet; and, came at a tiny fraction of the cost of the six billion dollar Super Hornet gap filler. Not a single argument for F-111 retirement was anything but non-sequitur speculation by the Defence bureaucracy. Australia's F-111 fleet accounted for 40-60% of Australia's punch and its loss produces a self induced but very real capability gap of unprecedented proportions (US DoD image).